If you have always wanted to dive here is your chance. Discover the wonders of the underwater world with our Try Dive programme. Our international team of Instructors will ensure that this is the highlight of your holiday. Almost anyone can enjoy diving, you will be surprised by just how easy it is. After a simple and fun theory lesson you will soon be gliding through our amazing underwater world. 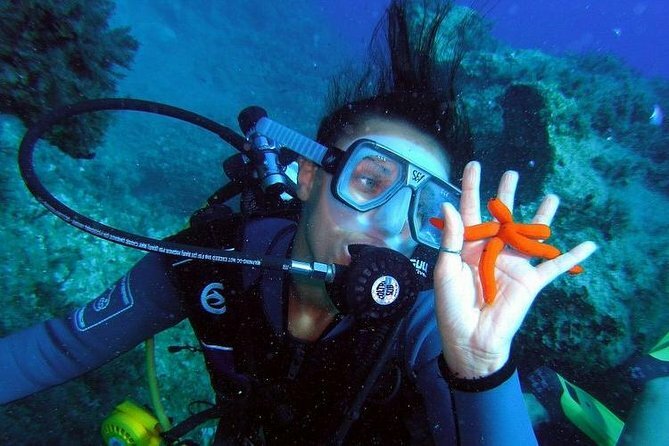 The Try Dive programme is available at our dive sites of Kalithea (full day), Kolymbia or Pefkos (half day). During your first dive you will be photographed and will have the option to purchase your photographs. Divers in Kalithea will also be filmed and will be able to purchase a dvd of their first dive. Discover the world of scuba diving and explore the crystal clear waters of the Aegean through a unique underwater experience. If you have always wanted to dive here is your chance. Discover the wonders of the underwater world with our Try Dive programme. Our international team of Instructors will ensure that this is the highlight of your holiday. Almost anyone can enjoy diving, you will be surprised by just how easy it is. After a simple and fun theory lesson you will soon be gliding through our amazing underwater world. The Waterhoppers's Try Dive programme is available at our dive sites of Kalithea (full day), Kolymbia or Pefkos (half day). During your first dive you will be photographed and will have the option to purchase your photographs. Divers in Kalithea will also be filmed and will be able to purchase a dvd of their first dive. The Waterhoppers's Try Dive programme is available at our dive sites of Kalithea (full day), Kolymbia or Pefkos (half day). During your first dive you will be photographed and will have the option to purchase your photographs. Divers in Kalithea will also be filmed and will be able to purchase a dvd of their first dive.